“Gone are the days of our Victorian ancestors who amassed vast collections of butterflies; mounted dead specimens which one may argue provided valuable scientific insight, but to me they seem like nothing more than sad fading shells compared to the glorious living, flying, dancing creatures themselves. I think in part that these old style collectors; aurelians as they were called, longed to somehow posses the fragile and fascinating beauties they beheld. Today this yearning is largely assuaged by photography, painting and yes, embroidery. 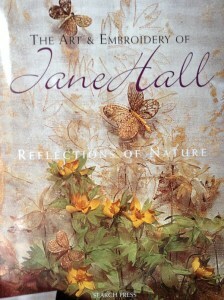 However, in respect of the art and embroidery of Jane Hall, any preconceived idea of this skill set, will be challenged. To me, encountering Jane’s artwork was a revelation as it will be to many who pick up this book. Jane Halls profound love of butterflies and phenomenal skill as an artist and embroiderer will surely inspire many, though perhaps few will come close to achieving such artistry as Jane, a world leader in this specialised area. It is said that “wonder is the beginning of philosophy” and Jane’s art will surely inspire the reader to look more closely, wonder and think. If enough of us do this it will lead to further and better understanding of the butterfly world and ultimately on to vital conservation of habitat before even more species are lost forever and we are condemned to morn the loss of some of the most beautiful creatures on earth. I have entrusted Jane with live butterfly pupae, enabling her to observe how they hatch and dry their wings in readiness to take flight. She has wandered in my wild flower meadows, woodlands and tropical green houses, camera and sketch book in hand but mainly using those extraordinary gifted eyes. All this I can feel pulsing through the book. On one level this book will be a joy to posses and browse through, allowing the imagination to roam. On another level it is a unique and meticulous guide to the application of the artistic techniques involved. “Exciting”, “exhilarating”, “unbelievable” are words that capture the brilliance of Jane Hall’s amazing embroideries. The sheer magic of her work is in its beauty and its awe-inspiring attention to detail. Stitched and woven in pure silk and gold threads on delicate fabrics, embellished with fragments of shell, iridescent feathers and semi-precious stones, her work takes on a quality that is both startling and memorable. 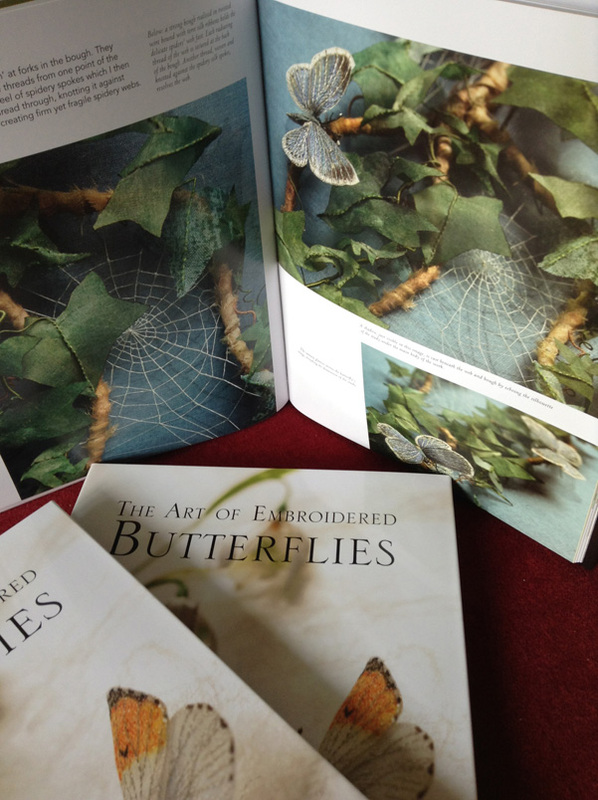 Flowers, leaves, grasses, toadstools, butterflies and bugs are translated into three-dimensional scenes and panels, born of a love of nature and an intuitive understanding of the nature world. Jane works almost entirely by hand, evolving each piece, adapting ideas and changing the image as it naturally develops. 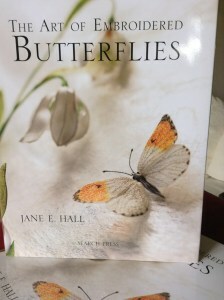 This book explores Jane’s extraordinary world, the materials she uses, her techniques, and her understanding and interpretation of nature. 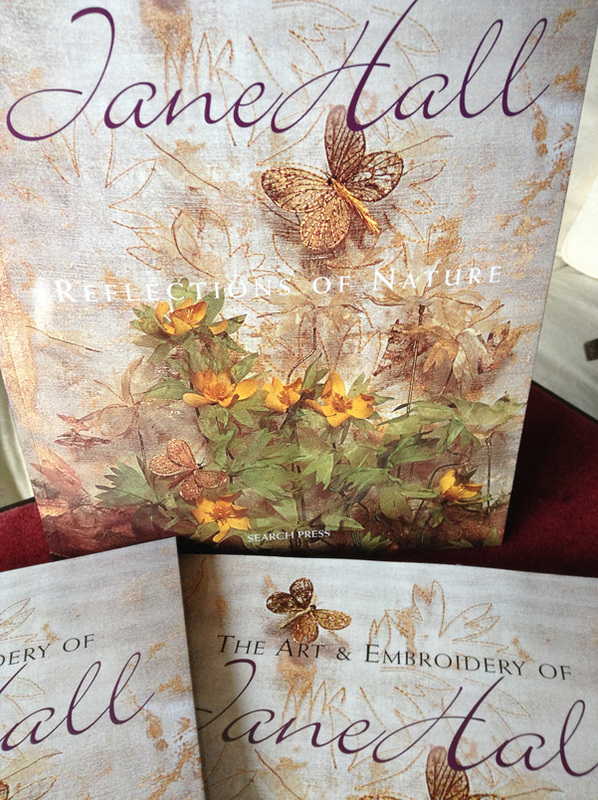 Packed with ideas, inspiration and information, it will appeal to all embroiderers and textile artists everywhere.